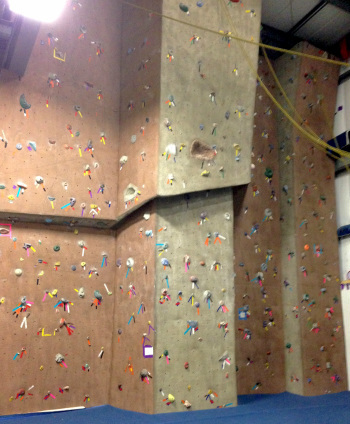 Come in and enjoy the fun and fitness of our climbing wall. Climbing memberships are available. Paramount's climbing members enjoy the benefit of unlimited climbing during operational hours. Members must be belay certified by one of our climbing instructors. The belay certification can be taken by prior arrangement. Each year all of Paramount's climbers will be required to re-new their climbing certification. This is done to ensure the safety of each climber. In order to use our rockwall at Paramount by yourself and a friend, you and/or your friend need to be belay certified. If you are interested, please let us know and our instructor can certify you with a belay course that lasts about 45 minutes (cost $15). If you have been belay certified elsewhere, arrange a time to show our climbing staff that you can belay, and then there is a $5 charge to keep a certification on file. ​However, if you are not belay certified, we can supply the belayer! Call us to arrange a time for your group (5 or more participants minimum. $15 per person for 2 hours).